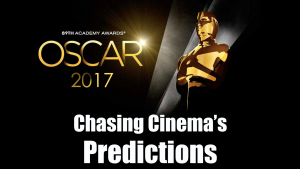 This Sunday, Feb. 26, is the 89th Academy Awards and just like years past the Oscars has got us excited here at Chasing Cinema. Below are Jacob Tiranno and Louie Coruzzolo’s 2017 Oscar Predictions. We both feel like La La Land will follow its recording-tying nominations for a single film (14) with a big night and walk away with a lot of hardware. Also, we feel that the terrific performances by Denzel Washington and Viola Davis in Fences will take home the Best Actor and Best Supporting Actress Oscars respectively. To check out our full coverage of the biggest winners and the must-see moments of the show make sure you follow us on Twitter (@ChasingCinema) as we live-tweet the Oscars this Sunday, February 26 at 7 p.m. ET/4 p.m. PT! Don’t forget that we will be live-tweeting the Oscars! Click here to Follow Us on Twitter!